Background: To improve utilization of resources and reduce overtriage, two-tiered trauma team activation (TTA) system was implemented. The system activates a complete or selective trauma team (CTT, STT). Activation is based on the mechanism of injury (MOI), prehospital vital signs and injuries. Objectives: The objective was to evaluate the feasibility, effectiveness and safety of the implementation of a two-tiered system and whether the triage is done according to the TTA criteria. Methods: A prospective observational study was performed at the emergency department (ED) of a Level I trauma center. Data were collected on TTA criteria, patient demographics, MOI, prehospital vital signs, imaging modalities and blood gas analysis in the ED and inhospital data. Results: In 3 months, 186 patients were presented to the trauma resuscitation room. Thirty-four patients were excluded, 152 patients were included for analysis. Median age was 48 years (range 1–93), 64% were males. In 73%, the CTT was activated, in 27% the STT, the STT was upgraded three times. Seventy-nine patients had to be admitted, the median length of stay was 5 days (range 1–62). Thirty-eight patients needed Intensive Care Unit (ICU) admission; the median ICU stay was 3 days (range 1–33). Three patients died in the resuscitation room, in total, nine patients died. Overtriage was 29% and undertriage 7%. No significant difference was found for mortality, duration of hospital admission or ICU admission across the four groups (correct activation STT, undertriage, overtriage, and correct activation CTT). Conclusions: This TTA system identifies those patients in need of a CTT adequately with an undertriage percentage of 7%, indicative of improved care for the severely injured and a more appropriate use of resources. With this model, the overtriage is set to an acceptable percentage of 29%. In the Netherlands, hospitals are divided into three levels of trauma care, according to their expertise and facilities for the assessment and treatment of the severely injured patients. A level I trauma center provides the highest level of care for severely injured patients; it has a full range of specialists and equipment available 24 h a day. With the designation of eleven level I trauma centres in the Netherlands, the prehospital triage system has evolved, as patients are transported to the appropriate trauma center more quickly. Consequently, inhospital triage systems have become more important to enhance trauma care and minimize triage errors. Inhospital triage is now considered an important function of the emergency department (ED). Inhospital triage involves amongst others the decision which trauma team should be activated, based on a prehospital report of (helicopter) emergency medical services (H) EMS. The EMS provide rapid and adequate care for patients with time-critical and life-threatening injuries while using all valuable resources properly. Overtriage can be described as the unnecessary mobilization and utilization of medical resources for patients without significant injuries, while undertriage is defined as inadequate treatment of patients that are significantly injured. Frequent overtriage, leading to unnecessary mobilization of full resources, can demotivate staff due to the redundancy of their efforts and can negatively impact the trauma teams responsiveness. In this Level 1, trauma center an alteration was made in the inhospital triage system. The former system was a single-tiered system, always activating the entire general trauma team (GTT). Consequently, this GTT was often activated for stable patients with minor injuries, which can be considered overtriage. A previous study showed that up to 33% of the patients presented to the trauma resuscitation room were discharged without the need of care of the GTT or even without being admitted. This can also be considered as the patient receiving a higher level of care than needed. A considerable percentage of overtriage is deemed necessary to minimize undertriage, a percentage of 50% accepted by the American College of Surgeons Committee on Trauma. However, the former system generated an overtriage percentage above this limit. A study by Boyle et al. showed that mechanism of injury (MOI) criteria are poor predictors of patients who will go on to be inhospital defined major trauma patients. Individual MOI has no clinical significance in prehospital trauma triage in the absence of physiological instability and/or significant pattern of injury. To improve inhospital triage the trauma team activation (TTA) system was changed in January 2013 from a single-tiered TTA system based on high-energy trauma to a two-tiered TTA system based on specific criteria concerning patients vitals, MOI, and type of injuries sustained. In this new system, a divide is made in the dispatch of a complete trauma team (CTT) or a selective trauma team (STT). [Table 1] shows the constitution of both teams and [Table 2] shows the criteria for activation of the CTT. When an announcement does not meet the criteria for the CTT, the STT is activated. The rationale behind this division was to allocate resources more properly.,, This is done to minimize overtriage and facilitate appropriate use of staff and resources, since overtriage may be costly and inefficient. The CTT aims to rapidly resuscitate and stabilize the most severely injured patient and to reduce the time to diagnosis and treatment. A team approach allows for the distribution of the several tasks in assessment and resuscitation of the patient among a number of specialist., This can lead to a reduction in time from injury to definite intervention. The STT provides care for patients without abnormalities in their vital functions or without significant injuries, who require a lower level of care. This study aimed to evaluate the effectiveness and safety of the implementation of a two-tiered system and whether the triage is done according to the TTA criteria. This concerns a prospective observational cohort study. The cohort comprises of all consecutive trauma patients who were presented to the trauma resuscitation room of our level 1 trauma center by EMS or HEMS within 3 months. To be eligible for inclusion, patients had to be announced by (H) EMS and had to be presented to the trauma resuscitation room with the pending alert for either an STT or CTT. Patients were excluded when presented without any notification or if there was no or incomplete registration of the announcement on the TTA form, if dead on arrival, if inhospital data was incomplete or if a patient was relocated to a different hospital. Data on patient characteristics, TTA criteria, and inhospital data were obtained. Data collection was done by collection of the trauma resuscitation room registration forms, this entails the patient number, TTA criteria, which trauma team was activated, upgrading or downscaling. Inhospital data were collected by linking patient numbers to data that is registered in the inhospital and to the regional trauma database. Variables that were retrieved were: Patient demographics, when performed outcome of the focused assessment with sonography in trauma (FAST) examinations, additional radiological examinations, arterial blood gas (ABG), length of stay (LOS), Intensive Care Unit (ICU) admission, length of ICU admission, inhospital mortality, and 30-day mortality. Major trauma patients are classified as those with an ISS >15. 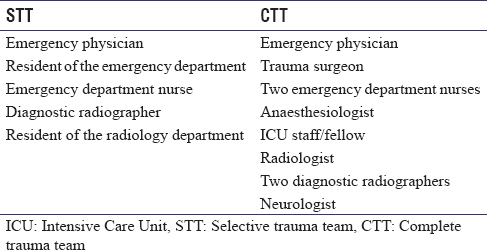 Correct classification of trauma team was assessed using the CTT dispatch criteria. All data were compared for the CTT versus STT. ISS version 2008 was used and was calculated from the abbreviated injury scale for each body region and represents the severity of the injuries sustained. The sums of accurate and inaccurate dispatches were presented for both trauma teams. The calculation of over- and under-triage was based on the assumption that all of the patients who meet the major trauma patient criteria should have access to the care of the CTT on hospital admission. Undertriage is defined as the proportion of patients who meet the major trauma criteria but were triaged to the STT. Comparison between the trauma teams was done for inhospital mortality, 30-day mortality, LOS, ICU admission, ISS score and length of ICU stay. The statistical data analysis was performed using SPSS 21.0 statistical analysis program (SPSS Inc., Chicago, IL, USA). Groups were compared using the Chi-square test for categorical variables, or t-test, and the Mann–Whitney U-test for continuous variables. Data are presented as percentages for categorical data, as mean and standard deviation for normally distributed numerical data and as median and interquartile range for skewed numerical data. Differences were considered to be significantly when P < 0.05. Between October 1, 2014, and January 1, 2015 a total of 186 patients were presented to the trauma resuscitation room. Thirty-four patients were excluded: Eleven patients were excluded because they were presented because of a non-traumatic event, 23 were excluded due to due to non-registration of the CTT criteria. The remaining 152 patients were included for further analysis, 64% of the included patients was male and the median age was 48 (range one to 93 years) [study characteristics [Table 3]. When reviewing the CTT criteria, the activation was mainly based on MOI. In 22 cases, there was an airway obstruction or an airway tube placed in the prehospital setting. In four cases, there was insufficient breathing, there were five patients with a heart rate >120/min, eleven patients had a systolic blood pressure <100 mmHg, ten patients had a O2 saturation <95% despite oxygen therapy, one patient had an estimated blood loss of more than 500 ml, there were nineteen patients with an Glasgow coma score (GCS) ≤13 and two patients had pupillary abnormalities. Concerning the injuries in four cases, there was a penetrating trauma to the head, neck, torso, pelvis, groin area; six patients had more than two long bones fractures and four patients with suspicion of more than four rib fractures. Two patients were suspected to have an unstable pelvic fracture, in 36 cases a physician staffed EMS was involved and there was one paraplegic patient. Concerning the age, 24 patients were older than 70 years. There were no patients presented with burns with a burn surface area >20%, a capillary refill of more than 4 s, spine injury, flail chest, tension pneumothorax, or inhalation injury. In 19 cases, it was not registered whether the CTT or the STT had been deployed; therefore, they were excluded for further analysis with regard to the division of the CTT and STT. The new two-tiered model yielded an overtriage 29% with an associated undertriage 7% [Table 4]. No statistical significant difference was found for ISS score across the four groups (correct selective, undertriage, overtriage, and correct complete). Likewise, no statistical significant difference was seen across the four groups inhospital mortality, 30-day mortality, LOS, ICU admission, or the duration of ICU admission. When reviewing the additional examinations requested per team, an almost 1:4 ratio was seen in the total number of requests (resp. STT vs. CTT). When reviewing the additional radiological examinations requested per team, an almost 1:4 ratio was seen in the total number of requests (resp. STT vs. CTT). The STT had no abnormalities on chest X-ray in 52.9% (n = 18) and the CTT in 56.6% (n = 56). ABG was performed in an almost 1:6 ratio and FAST examinations in a 1:5 ratio. All additional examinations are shown in [Table 5]. The implementation of a two-tiered TTA protocol in our level 1 trauma center led to a substantial change in response in the trauma resuscitation room, with no evidence of adverse outcomes. 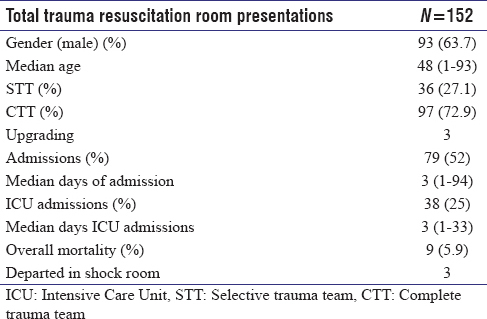 The STT now manages 27% of all the trauma resuscitation room presentations, this thought to decrease cost because of better utilization of resources and furthermore improve trauma care.,,,, In the study period, 186 patients were included in the study, however, this number is lower than the actual number of trauma resuscitation room presentations due to under-reporting and under registration on the TTA forms. As some triage, nurses do not fill out the TTA form or the form gets lost in process of a trauma resuscitation room presentation. The normal incidence of shock room presentation is around 3–4/day, whereas the incidence in our study was approximately 2/day. The missing shock room presentations could not be retrospectively included as we did not have the information on the TTA forms. The usage of the new model however does enhance pre-to-inhospital communication because the triage nurse is inclined to ask more questions regarding the prehospital situation which will help in the identification of the severely injured patient. This study evaluates the TTA based on both physiologic and anatomic criteria. Studies focusing solely on mechanism report over utilization of the teams resources and is not cost-effective.,, Studies combining physiologic and anatomic criteria shows usefulness in triage scheme decision-making process. Therefore, the new TTA model, which triages not solely on MOI but also on vital parameters, injuries sustained, and other risk factors, reduced the number of TTA in which the entire trauma team were required to attend. This study shows that the new two-tiered system appropriately identifies those patients in need of care of the CTT. Only nine (6.8%) patients should have been cared for by the CTT but received the care of the STT. Although this did not influence mortality or morbidity across this group. The overtriage rate in the new model is 28.6% (38 patients who did not meet CTT criteria that did receive care of the CTT) which is within the range as recommended by the American College of Surgeons Committee on Trauma. This is comparable with the number Fung Kon Jin et al. report in a similar trauma center in a comparable geographical setting. Overall the data suggest that the activation system works as intended to identify severely injured patients for activation of CTT. 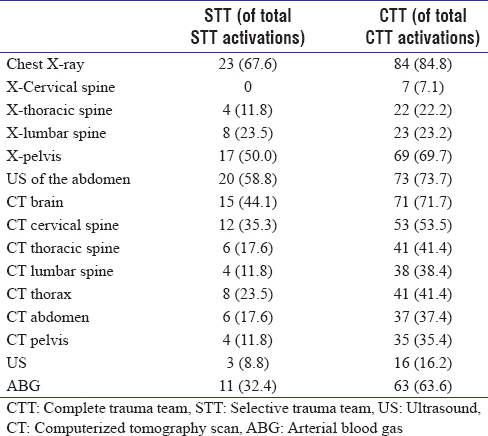 The request for additional (radiological) examinations shows an almost 5:1 ratio when comparing the CTT with the STT. This is probably because the new criteria are superior in identifying the severely injured versus the triage-based solely on MOI. Filtering the less injured patients for the STT group consequently less in need of radiological examinations. This substantiates the thought that the new activation system will better utilize resources and reduces costs. This study is subject to a number of limitations. The prehospital measurement and interpretations of vital signs, injuries and the mechanism of trauma is subject to intraobserver variability. Another limitation is the selection bias of patient inclusions due to missing activation forms as the actual number of trauma resuscitation room presentation is higher. Leading to a less than optimal sample collection. This study reports on the alteration from a single-tiered TTA system based on MOI to a two-tiered TTA system based on vital signs and injuries sustained. Based on these new criteria, either a CTT or a small STT is activated in the trauma resuscitation room. The usage of the new model may aid to enhance pre-to-inhospital communication. Although prehospital identification of the severely injured remains a strenuous matter, our results suggest that the two-tiered system ensures appropriate trauma care while optimizing the utilization of limited surgical resources. This two-tiered trauma team response system allows for appropriate usage of resources while minimizing over and undertriage. It could, therefore, be a suitable system for urban level 1 trauma centers. It furthermore enhances pre-to-inhospital communication, which will help in the identification of the severely injured patient. Government of the Netherlands, the Ministry of Health, Welfare and Sport. Policy Vision Traumacare 2006-2010; 2010. Available from: http://www.rijksoverheid.nl/documenten-en-publicaties/kamerstukken/2006/04/19/beleidsvisie-traumazorg-2006-2010.html. [Last accessed on 2016 Nov 14]. Fung Kon Jin PH, van Olffen TB, Goslings JC, Luitse JS, Ponsen KJ. In-hospital downgrading of the trauma team: Validation of the academic medical center downgrading criteria. Injury 2006;37:33-40. Savitsky E, Eastridge B, Katz D, Cooper R. Combat Casualty Care: Lessons Learned from OEF and OIF. Fort Sam Houston: The Office of the Surgeon General Borden Institute; 2011. Giannakopoulos GF, Unal Y, Bloemers FW, Bakker FC. Overtriage, a problem in handeling the prehospital triage model in the trauma region North-West Netherlands. Ned Tijdschr Trauma 2009;17:3-7. American College of Surgeons, Committee on Trauma. Recourses for Optimal Care of the Injured Patient; 2014. Available from: https://www.facs.org/~/media/files/quality%20programs/trauma/vrcresources.ashx. [Last accessed on 2016 Nov 10]. Boyle MJ, Smith EC, Archer F. Is mechanism of injury alone a useful predictor of major trauma? Injury 2008;39:986-92. Tiel Groenestege-Kreb D, van Maarseveen O, Leenen L. Trauma team. Br J Anaesth 2014;113:258-65. Cherry RA, King TS, Carney DE, Bryant P, Cooney RN. Trauma team activation and the impact on mortality. J Trauma 2007;63:326-30. Kouzminova N, Shatney C, Palm E, McCullough M, Sherck J. The efficacy of a two-tiered trauma activation system at a level I trauma center. J Trauma 2009;67:829-33. Esposito TJ, Offner PJ, Jurkovich GJ, Griffith J, Maier RV. Do prehospital trauma center triage criteria identify major trauma victims? Arch Surg 1995;130:171-6. Bevan C, Officer C, Crameri J, Palmer C, Babl FE. Reducing “cry wolf” – Changing trauma team activation at a pediatric trauma centre. J Trauma 2009;66:698-702. Driscoll PA, Vincent CA. Organizing an efficient trauma team. Injury 1992;23:107-10. Eastes LS, Norton R, Brand D, Pearson S, Mullins RJ. Outcomes of patients using a tiered trauma response protocol. J Trauma 2001;50:908-13. Kohn MA, Hammel JM, Bretz SW, Stangby A. Trauma team activation criteria as predictors of patient disposition from the emergency department. Acad Emerg Med 2004;11:1-9. Nuss KE, Dietrich AM, Smith GA. Effectiveness of a pediatric trauma team protocol. 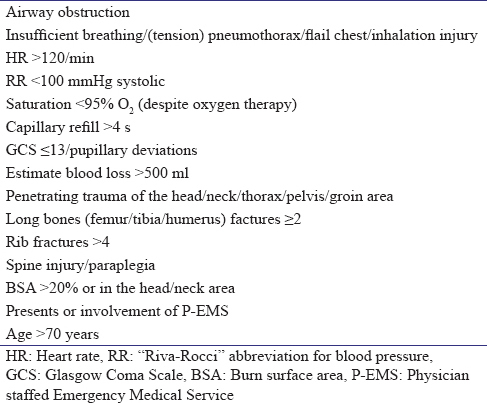 Pediatr Emerg Care 2001;17:96-100. Ochsner MG, Schmidt JA, Rozycki GS, Champion HR. The evaluation of a two-tier trauma response system at a major trauma center: Is it cost effective and safe? J Trauma 1995;39:971-7. Tinkoff GH, O'Connor RE, Fulda GJ. Impact of a two-tiered trauma response in the emergency department: Promoting efficient resource utilization. J Trauma 1996;41:735-40. Kaplan LJ, Santora TA, Blank-Reid CA, Trooskin SZ. Improved emergency department efficiency with a three-tier trauma triage system. Injury 1997;28:449-53. Qazi K, Wright MS, Kippes C. Stable pediatric blunt trauma patients: Is trauma team activation always necessary? J Trauma 1998;45:562-4. Wong K, Petchell J. Paediatric trauma teams in Australia. ANZ J Surg 2004;74:992-6. Dowd MD, McAneney C, Lacher M, Ruddy RM. Maximizing the sensitivity and specificity of pediatric trauma team activation criteria. Acad Emerg Med 2000;7:1119-25.